GCA Altium acted as exclusive financial advisor to NORD Holding Unternehmensbeteiligungsgesellschaft mbH on the sale of all shares in WEMAS, a leading German provider of passive mobile road safety equipment, to European investment company Gimv. WEMAS Absperrtechnik GmbH, located in Gütersloh, Germany, was established in 1971 and has grown into a full-range provider of certified passive mobile road safety equipment, including protective barriers, delineators, base plates, warning lamps and traffic cones. The company, which employs more than 120 people and serves over 1000 clients, supplies both wholesalers and service providers for the road safety, infrastructure and construction markets, predominantly in the Germanic region. WEMAS is well placed to benefit from the growing market it operates in thanks to its innovative and high-quality product and value-added service offering, which includes the highest number of certified road safety products in the industry and a wide range of customised items. In the coming years, the company intends to further grow its passive mobile safety business in the Germanic region and internationally. Moreover, the company wants to explore further growth into adjacent road safety market segments, potentially through acquisitions. 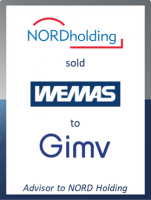 Gimv is taking over WEMAS from NORD Holding, which acquired the company in 2011. Gimv is acquiring a significant majority, while the balance will be held by the company's management team. The transaction is subject to approval by competition authorities. No further financial details of the transaction will be announced.